• Ships shall be provided with a main steering gear and an auxiliary steering gear to the satisfaction of the Administration. • The main steering gear shall be of adequate strength and sufficient to steer the ship at maximum service speed. The main steering gear and rudder stock shall be so designed that they are not damaged at maximum astern speed. • The auxiliary steering gear shall be of adequate strength and sufficient to steer the ship at navigable speed and capable of being brought speedily into action in an emergency. (iv) The exact position of the rudder, if power operated, shall be indicated at the principal steering station. • The main steering gear shall be capable of putting the rudder over from 35 degrees on one side to 35 degrees on the other side with the ship running ahead at maximum service speed. The rudder shall be capable of being put over from 35 degrees on either side to 30 degrees on the other side in 28 seconds at maximum service speed. • The auxiliary steering gear shall be operated by power in any case in which the Administration would require a rudder stock of over 228.6 millimetres (9 inches) diameter in way of the tiller. • Where main steering gear power units and their connections are fitted in duplicate to the satisfaction of the Administration, and each power unit enables the steering gear to meet the requirements of sub-paragraph (i) of this paragraph, no auxiliary steering gear need be required. • Where the Administration would require a rudder stock with a diameter in way of the tiller exceeding 228.6 millimetres (9 inches) there shall be provided an alternative steering station located to the satisfaction of the Administration. 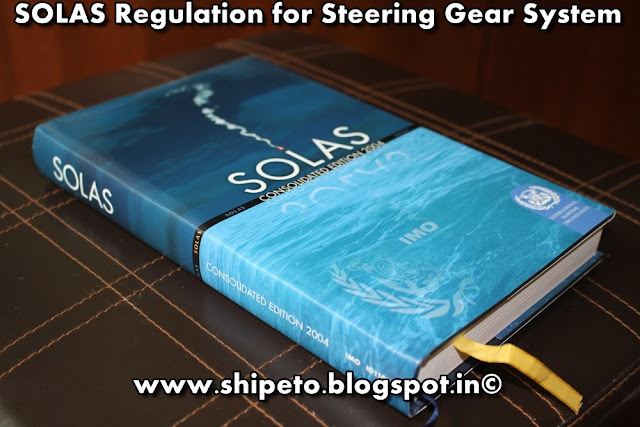 The remote steering control systems from the principal and alternative steering stations shall be so arranged to the satisfaction of the Administration that failure of either system would not result in inability to steer the ship by means of the other system. • Means satisfactory to the Administration shall be provided to enable orders to be transmitted from the bridge to the alternative steering station. • The auxiliary steering gear shall be operated by power in any case in which the Administration would require a rudder stock of over 355.6 millimetres (14 inches) diameter in way of the tiller. of paragraph (a) of this Regulation. (a) Passenger ships and cargo ships. Indicators for running indication of the motors of electric and electro hydraulic steering gear shall be installed in a suitable location to the satisfaction of the Administration. • Electric and electro hydraulic steering gear shall be served by two circuits fed from the main switchboard. One of the circuits may pass through the emergency switchboard, if provided. Each circuit shall have adequate capacity for supplying all the motors which are normally connected to it and which operate simultaneously. If transfer arrangements are provided in the steering gear room to permit either circuit to supply any motor or combination of motors, the capacity of each circuit shall be adequate for the most severe load condition. The circuits shall be separated throughout their length as widely as is practicable. • Short circuit protection only shall be provided for these circuits and motors. (c) Cargo ships of less than 5,000 tons gross tonnage, (i) Cargo ships in which electrical power is the sole source of power for both main and auxiliary steering gear shall comply with sub-paragraphs (i) and (ii) of paragraph (b) of this Regulation, except that if the auxiliary steering gear is powered by a motor primarily intended for other services, paragraph (6)(ii) may be waived, provided that the Administration is satisfied with the protection arrangements. • (ii) Short circuit protection only shall be provided for motors and power circuits of electrically or electro hydraulically operated main steering gear.